The 2015 motionball Marathon of Sport Winnipeg welcomed 41 Teams of young professionals to Westwood Collegiate on Sunday September 23rd for a fun-filled day of sport in support of the Special Olympics Canada Foundation! 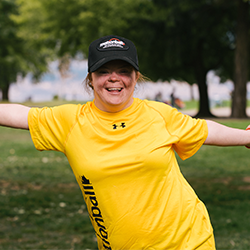 Participants enjoyed a day of athletic competition that saw motionball supporters compete alongside local Special Olympics Manitoba athletes in a variety of sports & activities including soccer, ultimate frisbee, bocce, basketball, benchball, kickball, and football. The playing field wasn’t the only place where athletes competed. Each team of 10 participants raised a minimum of $1000 ($100 per person) through pledges. Thanks to their incredible fundraising efforts we raised over $85,000 net in support of the Special Olympics Canada Foundation! To pre-register your Team for the 2016 motionball Marathon of Sport Winnipeg, please email Julie at julie@motionball.com. There are many ways that your organization can get further involved with motionball!To learn more email Marsha at marsha@motionball.com.